Win an Arcam AVR600 receiver and Solo Mini system worth £4600 | What Hi-Fi? One lucky winner will receive a superb set of hi-fi and home cinema gear from the Cambridge-based company, worth a total of £4600. 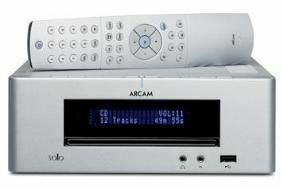 The AVR600 – reviewed in our June 2009 issue – is that rare thing: a £3500 multichannel receiver that's worth every penny. Comprehensively specified, engagingly punchy and and exceptionally musical, it's a stunning machine for both music and movie soundtracks. And it won't end there for our lucky winner. The Solo Mini all-in-one hi-fi system is one of Arcam's highly impressive attempts to cram seriously high-quality sound into one box, just-add-speakers hi-fi solution. And to round it off, remember that 'just add speakers'? Well if you're our lucky winner, you won't need to – you'll also win a pair of Arcam Muso speakers, so you can start listening to your Solo Mini system immediately. To enter, just click here. Competition closes on July 1st 2009.